We catch up here with Marlowe the morning after he takes his case as he joins the police in their investigation of the Sternwood family’s chauffeur, dead in an apparent accident that soon reveals itself to be murder. Following a few leads takes Marlowe to a flat where he encounters blackmailer Joe Brody (Edward Fox), femme fatale Agnes Lozelle (Joan Collins), General Sternwood’s flighty youngest daughter Camilla (Candy Clark), and trigger-happy gunsel Karl Lundgren (Simon Fisher-Turner)… all of whom armed with a handgun but, as Marlowe wryly notes, no brains to boot. 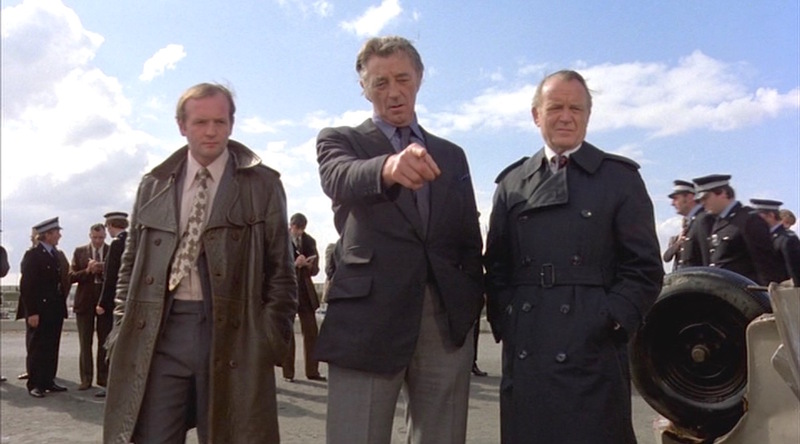 Philip Marlowe arrives at the docks in a dark gray sport jacket with a tonal plaid just subtle enough that it is barely discernible in non-closeup shots. The jacket has fashionably broad notch lapels, though not as comically wide as “disco suit” lapels seen in the latter years of the ’70s and just broad enough to coordinate with the larger shirt collar and wider tie. The jacket rolls to a medium-low two-button stance that perfectly meets the trousers at Mitchum’s growing waist line. The jacket has a welted breast pocket for Marlowe’s blue silk display kerchief, slanted flapped hip pockets, and a flapped ticket pocket on the right side that slants back on the same axis as the top button. Unlike his English colleagues, Marlowe sees no need for a dramatic topcoat. 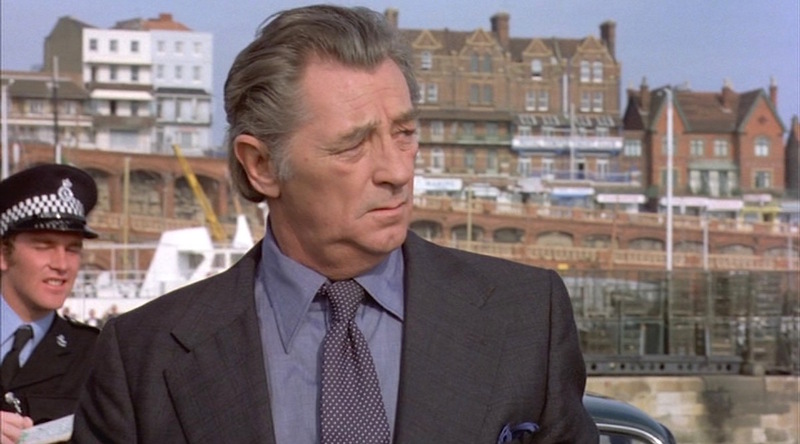 Mitchum wears a blue-gray melange cotton shirt made by legendary London shirtmaker Frank Foster with a metallic sheen, possibly indicative of high-twist cotton. The shirt has a tall and fashionably long-pointed semi-spread collar, a wide front placket with mother-of-pearl buttons, and single-button rounded cuffs. Marlowe treats himself to an evening sandwich. Marlowe’s tie consists of a field of small white polka dots on a dull dark navy ground. 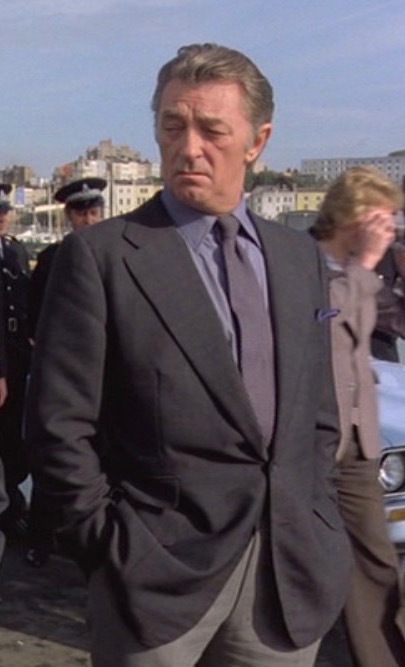 The tie is knotted in a four-in-hand and flares out to a wide blade that Mitchum keeps generally contained by his buttoned jacket. 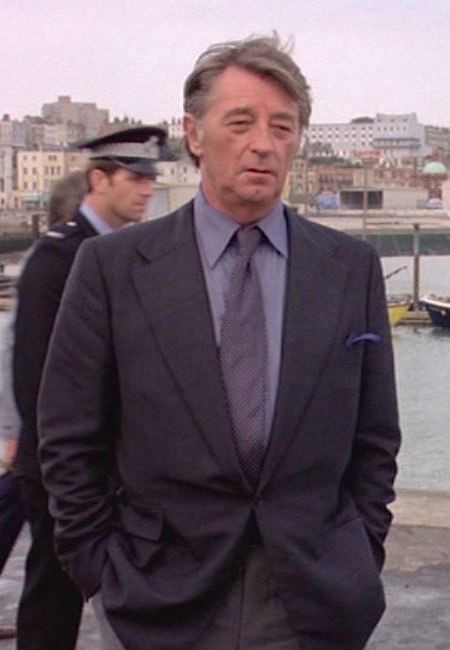 Mitchum wears a pair of gray flat front trousers in a mixed-yarn pick-and-pick (or “sharkskin”) wool. The flat front trousers have slanted side pockets and jetted button-through back pockets, and they are worn with a black leather belt that closes with a polished gold-toned single-prong buckle. 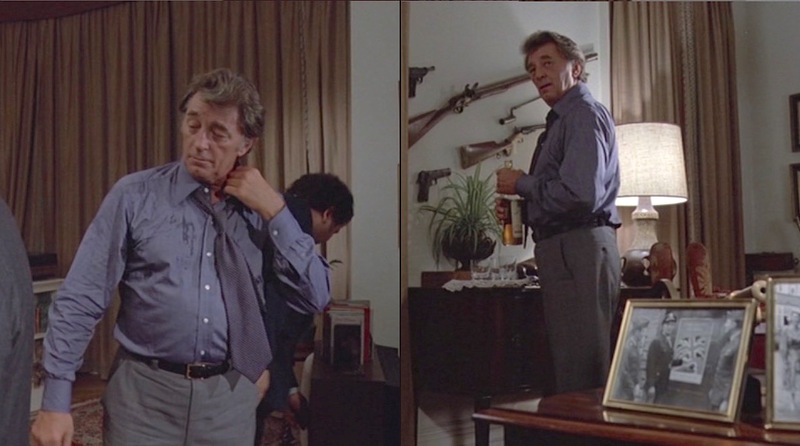 Mitchum unbuttons and unwinds – with his whiskey and firearms – after a long day. The trousers have an appropriately full fit, though the plain-hemmed bottoms are strongly flared with a full break all too reminiscent of bell-bottoms, making them the most dated (and, not coincidentally, least attractive) part of this otherwise classic outfit. 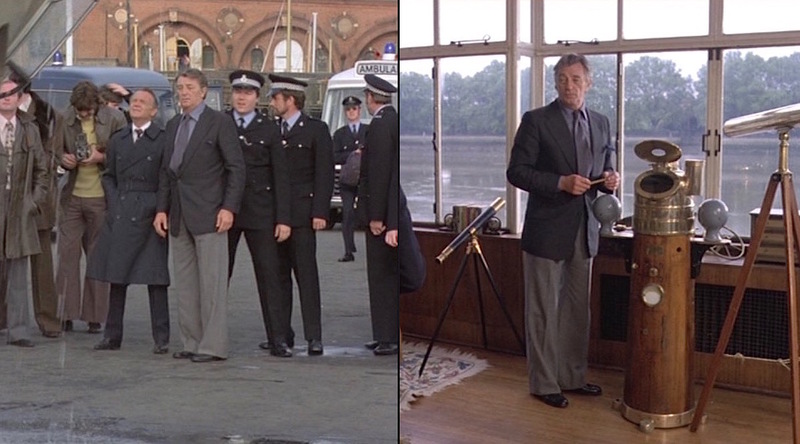 The bell-bottomed trousers take an outfit that would have worked three decades earlier in Bogie’s day and plunge it headfirst into the 1970s. Draped by his voluminous trouser bottoms are Marlowe’s black calf loafers which have medallion perforated wingtips and high vamps. You can find wingtip loafers available from many modern retailers including this pair from Stacy Adams. 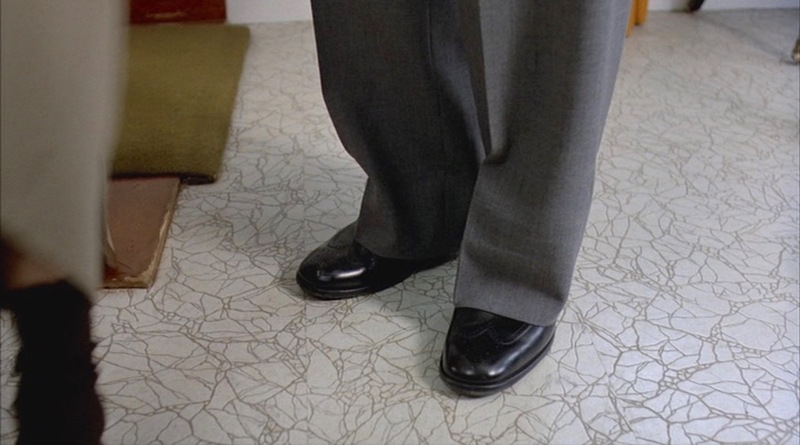 Normally, trouser bottoms like these would keep Marlowe’s socks hidden to the viewer, but the action sequence at Joe Brody’s flat gives us a brief glimpse of dark navy socks, likely made from the usual cotton lisle blend. Marlowe subdues the trigger-happy gunsel Karl Lundgren. 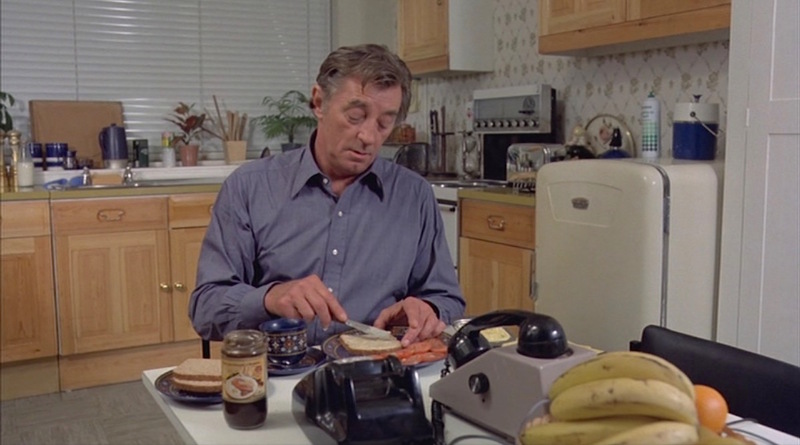 Robert Mitchum had been a decades-long Rolex wearer in real life by the time he played Philip Marlowe in The Big Sleep, and he appears to be wearing his own stainless Rolex DateJust with a silver dial and steel Jubilee bracelet on screen; he had also worn this watch four years earlier in Sydney Pollack’s The Yakuza (1975). 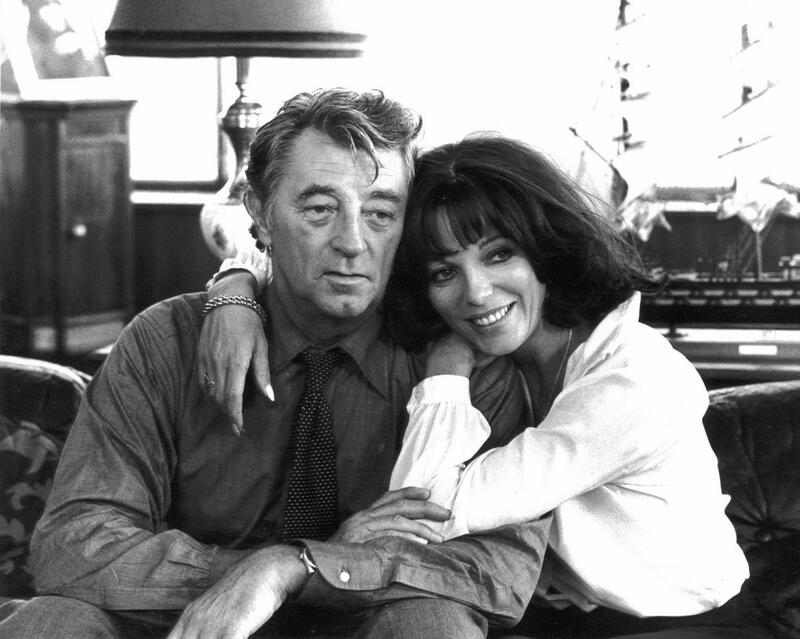 Robert Mitchum and Joan Collins between takes. Spot the Rolex on Mitchum’s left wrist. 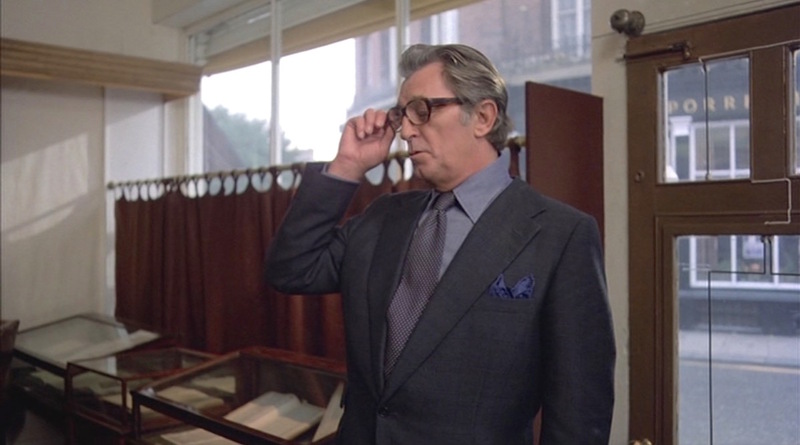 The thick tortoise-framed glasses that Marlowe wore with his blue suit for his very effective disguise make another brief appearance at Arthur Gwynn Geiger’s store. Note Marlowe’s blue silk pocket square, echoing the less vivid shades of blue in his shirt and tie. Robert Mitchum shows how a gray-anchored palette can still make an outfit interesting while also echoing the signature weather of his London environment. 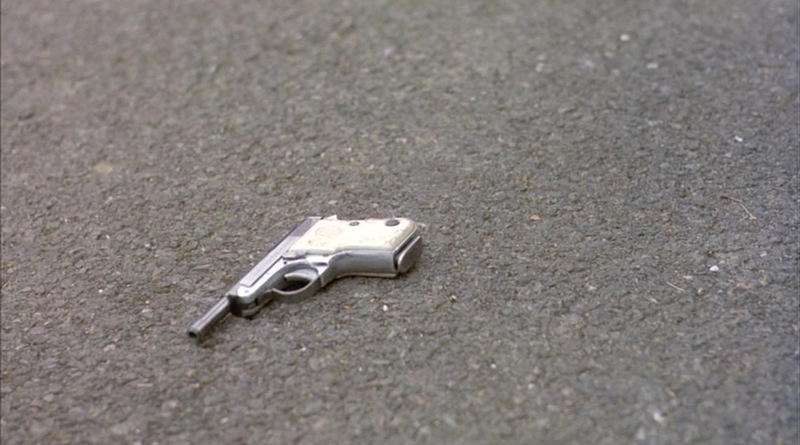 One unique gun that enters the story around this point is the stainless Beretta Minx carried by Camilla Sternwood (Candy Clark) and dropped during her tussle at Joe Brody’s flat. Marlowe eventually gets his hands on the Beretta, using it to threaten the intrusive gunsel Karl Lundgren (Simon Fisher-Turner) who tried to break up the party. 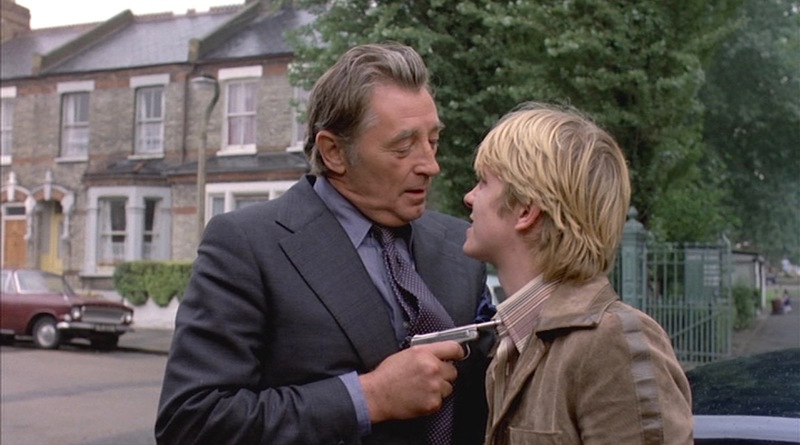 Marlowe catches up with the young Karl Lundgren and holds him at gunpoint. The Beretta Minx (M4) is a longer barreled variant of the Beretta Model 950 subcompact semi-automatic pistol, with the tip-up barrel extended to 3.75 inches. Its low-recoil .22 Short rimfire round was the first American metallic cartridge, developed in 1857 for the Smith & Wesson Model 1 at a time when most revolvers fired cap-and-ball ammunition. It was quickly phased out by larger and more powerful rounds, but the fast and quiet .22 Short remained popular for target and sport shooting as well as for hunting small game like raccoons. Camilla’s Beretta Minx falls to the ground. The Beretta Minx never attained the level of popularity as the more compact Model 950 Jetfire, and the final nail in the Minx’s coffin was placed when it was restricted from import to the U.S. in 1968. Production was swiftly ceased after 12 years. Buy the movie and read Chandler’s 1939 novel. So many guns lately… so few brains. 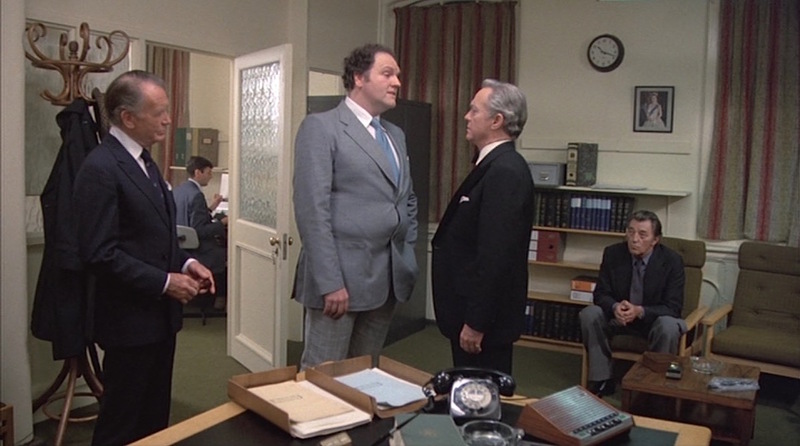 As opposed to Robert Mitchum, who dresses to flatter his increasing age (and girth), there is one gentleman who briefly appears on screen that disregards much of the conventional wisdom regarding how a suit should fit. Not only should the cop in the gray suit not have the jacket buttoned at all, but committing the faux pas of fastening both buttons just reveals the spare tire he’s smuggling around his waist.